Marshawn’s quip instantly attracted the attention of the Internet and the football blogosphere. There are few things this demographic likes more than snarky answers from their favorite athletes. Marshawn’s Media Day appearance instantly became meme-worthy. Marshawn took it a step further though. He filed an application to register this trademark less than three weeks later. Last week, on December 29, 2015, the USPTO granted Marshawn Lynch’s registration. Merry Christmas – you now have a federally registered trademark! The goods and services for his mark are essentially for athletic gear and clothing: shirts, hats, hooded sweatshirts, jackets, etc. 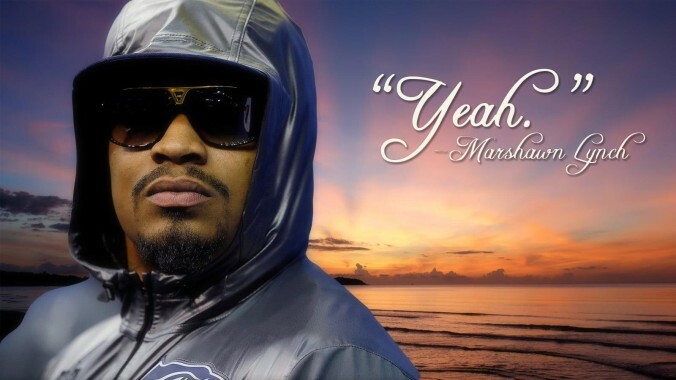 Marshawn has also parlayed his purported media shy reputation into a few commercial opportunities, with his commercial for Sprite practically mocking his media stance, but not using this particular trademarked catchphrase. Why am I bringing attention to these particular trademarks? Because I feel we have reached the peak of athlete self-awareness. From Twitter to Vines to instant meme-worthy events, athletes have begun to fully embrace their public images. They are now personally shaping how they are presented and marketed. Many athletes now smartly take an active approach instead of a reactive approach to their image. It is quite savvy. I have previously discussed Kobe Bryant’s elaborate plans for marketing his retirement announcement long before he actually made it public news. But Marshawn’s and Kirk’s particular tactics have added a little bit of a twist. In the past, such statements by Lynch and Cousins would have been roundly mocked by fans. They are the sort of comments that would have previously been a point of embarrassment for an athlete. These are blooper-reel type proclamations. It would have been derisively chanted at them by opposing fans as a means of getting under their skin. But no more. Today, athletes are hyper-sensitive to the potential commercial market for their respective “brands” and filing registrations to protect their trademarks is just the next logical step. They are a step ahead of the public when it comes to exploiting their value. Anything that brings attention to their brand is worthy of being positively embraced. The recent trend can be dated back to Johnny Manziel, when he sought to register “Johnny Football” with the USPTO. Manziel completed a Heisman-award winning campaign for Texas A&M, but as an amateur athlete he was unable to directly profit from his play on the football field. His family and his representatives nevertheless recognized that he could acquire a trademark on his nickname and seek licensing revenue from that, outside the purview of the NCAA’s strict amateur rules. On February 2, 2013, Manziel filed a trademark application as an individual and through JMAN2 Enterprises, LLC – his corporate entity. Even though that particular application has yet to receive a registration, the news from Manziel’s act created a new industry of sorts. For example, Manziel’s replacement at A&M, Kenny Hill, sought to register “Kenny Trill” as a trademark just a few games into the 2014 season. Hill’s trademark fell flat about the same time he lost his starting position and eventually left the team. This has not stopped other college athletes from taking similar steps to acquire trademark registrations. There have been numerous other trademark applications filed by college athletes in the last few years. Most have failed to achieve the notoriety or public awareness of Johnny Football™. Even though the recent trend may point to Johnny Manziel, the real godfather for the merging of sports and trademark rights is Pat Riley. Pat Riley, formerly the coach of the Los Angeles Lakers in the 1980s, is famous for not necessarily coining the term “THREE-PEAT” but he did see the commercial value in this term shortly after the Lakers won back-to-back championships after the 1988 season. Riley quickly sought to protect “THREE-PEAT” as a trademark. In the 27 years since, Riley and his corporate entity, Riles & Company, Inc., have acquired numerous registrations for “THREEPEAT” and “THREE-PEAT,” claiming first use in commerce dating back to September 20, 1988. The THREEPEAT mark has proven to be quite profitable for Riley, at least enough that Riley continues to use the mark today and has paid the necessary maintenance fees to keep the registration active. This is where the absurdity of these recent trademark applications comes to light. The USPTO will grant a trademark registration to distinctive marks that are currently being “used” in commerce. The filing fees are relatively inexpensive, as low as $225 to file an application today. These rights are not indefinite, however. You must continue to use the mark and you must also take other procedural steps to keep any registration alive. Per the USPTO’s rules, between the fifth and sixth year following registration, the trademark owner must file an Affidavit of Use. The trademark owner must also file additional Affidavits of Use before the end of every ten-year period after registration. Not surprisingly, there are additional fees associated with these Affidavits of Use. The owner must also file a Renewal Application every ten years, or else the trademark registration will be cancelled. While Pat Riley has demonstrated continued commercial value through his THREEPEAT® marks, it is highly unlikely that Marshawn Lynch or Kirk Cousins will be filing any Affidavits of Use or Renewal Applications five to ten years from now. Johnny Football may no longer be playing football by the time he has to file an Affidavit of Use. Accordingly, while I understand the desire to protect your image and your brand as an athlete, that is something that is intrinsic to you as a professional athlete. In contrast, seeking to protect a catchphrase that has limited commercial shelf life and is unlikely to ever truly be “used” in commerce seems short-sighted. By 2017, no one is going to be rushing out to buy a t-shirt emblazoned with Kirk Cousins’ image with the slogan “YOU LIKE THAT” on it. It is highly unlikely. We will always have the YouTube clip though. Remember, trademark rights exist the moment you use a mark in commerce. It may be limited to geographic rights under the common law, but they are still enforceable rights. The application and registration of “I’M JUST HERE SO I WON’T GET FINED” instead just strikes me as unnecessary paperwork, but at least someone got some billable hours out of it I guess. U.S. Trademark No. 48/78,656 (December 29, 2015). Yes, I am making fun of the Redskins’ lack of a federal registration, though that may change after the Federal Circuit’s recent decision in In re Tam. U.S. Trademark App. Serial No. 85/839,336 (filed February 2, 2013). U.S. Trademark No. 40/51,757 (registered November 8, 2011).